Rose water is widely used in skin care routines as it soothes the skin, restores moisture, refines pores, heals inflammations, and reduces wrinkles and fine lines. You can add rose water in your bath as well. In addition, placing a cotton pad dipped in rose water over sore eyes helps relieve eye irritation. It can also be used as eye drops for tired eyes. Rosewater has mild astringent, antibacterial, and anti-inflammatory properties. Besides, it is known to have narcotic, cephalic, and aphrodisiac effects. As it has a gentle, pleasing fragrance, you can use it in a homemade room freshener, too. 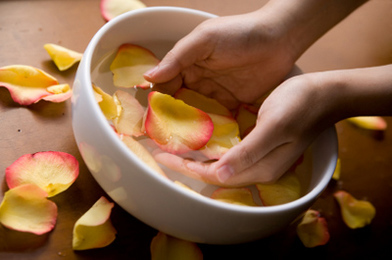 To prepare rose water at home, you need to boil two cups of distilled water, pour it in a cup of dried rose petals filled in a heat-resistant glass bowl, and cover with a lid. Let the solution steep for about half an hour. Finally, strain it with the help of cheesecloth, allow it to cool, and then store it in the refrigerator. You can use this solution for a few days. To make the rosewater last longer, consider adding a tablespoon of vodka in it. In case you want to use fresh roses then wash the rose petals (remove the stems and leaves) in cold water to remove chemicals before using them. It is best to use freshly picked roses or organic roses bought from a local florist. Watch this video showing how to make rose water for skin and hair care. If not interesting in making rose water yourself, you can purchase it from a grocery store or even online. However, keep in mind that commercially available rosewater may contain artificial fragrances and preservatives. • Prepare a homemade cold cream by mixing four ounces each of extra-virgin olive oil, organic rose water, vegetable glycerin, and two to three tablespoons of milk in a bowl. If the resultant lotion does not seem to have a thick consistency, then add more milk in it. • Regular application of rose water on hair and scalp helps maintain healthy hair and encourages hair growth. • You can use a combination of equal parts of rose water and witch hazel as an astringent for oily skin. Regularly applying this solution can help cure blemishes and dark spots, too. In case you have dry skin, use pure rosewater mixed with glycerin as a toning moisturizer. It also works as a great hand softener. Simply applying plain rose water is good for sensitive skin. • Another beauty care recipe can be prepared by three tablespoons of rose water with one tablespoon of plain yogurt and two tablespoons of oat flour. You may prepare oat flour by grinding rolled oats in a blender, food processor, or coffee grinder. Apply this facial mask for about 20 minutes and then wash it off with lukewarm water. It cleanses the skin and improves your complexion. • Soaking in bath water mixed with half a cup of rose water and the same amount of coconut milk is beneficial for getting beautiful, soft skin. • Massage a mixture of two tablespoons each of honey, sweet almond oil, two teaspoons of rose water, and three drops of vitamin E oil to fight wrinkles and moisturize the skin. Rinse it off after 15 minutes. • Make a homemade cleansing lotion by adding a quarter cup of organic honey, two tablespoons of liquid castile soap, and a tablespoon of bee pollen in a quarter cup of rosewater. • You can make a toner for mature skin by adding two-third cups of witch hazel (preferably alcohol-free), a teaspoon of apple cider vinegar, and approximately eight drops of glycerin in three-fourth cup of rosewater. Pour the solution in a sterilized bottle and shake well before use. • To soften your hands, prepare a thick paste by slowly mixing two tablespoons of glycerin (slightly heated) in two tablespoons of cornstarch. Next, gradually pour a cup of rose water in it while stirring. Use this mixture as a hand cream. Apart from skin care, rose water can be used for treating eczema, dermatitis, etc. 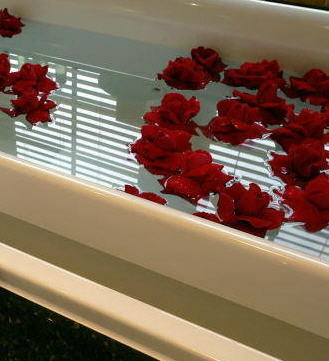 Moreover, as rose water has a relaxing effect, it helps relieve stress, fatigue, headache, and depression. In addition, rinsing your mouth with warm rose water can remove bad breath and reduce gum inflammation. It can be taken internally, too.